These policies and procedures apply to Foreign Service employees of the participating agencies. (b) 41 CFR 102-118.95 – What forms can my agency use to pay transportation bills? (12) The Bioterrorism Act of 2002, Public Law 107-188. Construction materials: Items of a nature and in volumes that would normally be used to construct or renovate a portion of a dwelling, or to construct a product exceeding the size of an ordinary item of furniture for personal use. Examples of construction materials include: wooden planks, boards, ceiling tiles, floor tiles or flooring, roofing materials, windows or doors or framing thereof, masonry, bricks, blocks, cement, sand, paneling, drywall boards, or hardware (e.g., nails) in volumes greater than would normally be used in an ordinary household workshop. Those materials that are part of artwork or crafts in total weight of less than 200 pounds may be regarded as household effects as determined by inspection as required. Construction materials are not authorized for transport or storage as part of an employee’s household effects (HHE) shipment; see 14 FAM 611.6. Employees or GSOs who are in doubt whether items qualify as HHE should contact the Transportation and Travel Management Division (A/LM/OPS/TTM) at TransportationQuery@state.gov. Continuous storage: See definition of nontemporary storage in this section. Consumables: Limited to foodstuffs for human consumption (with the exception of pet food or kitty litter) or items used for personal or household maintenance such as toiletries and nonhazardous cleaning supplies. Consumable shipments may not include household effects (HHE) or items used for the care and maintenance of vehicles; however, HHE shipments may include consumable items. Eligible family members (EFM): See definition of eligible family member in 14 FAM 511.3. Effects: See definition of household effects in this section. ELSO (European Logistical Support Office)—Antwerp: Located in Antwerp, Belgium, ELSO provides for the handling of household effects (HHE) to specified posts abroad. Foreign-flag vessel: Vessel registered under the laws of a foreign country. Gross weight: Obtained by adding to the net weight the weight of lift vans, outside shipping containers, and the weight of dunnage or bracing material used to secure articles in such vans or containers. Head of an executive department or agency: Means the Secretary of State, Secretary of Commerce, Secretary of Agriculture, or USAID Administrator, or a person exercising authority delegated by the agency or executive department head. Inherited personal effects: Personal effects that come into an employee’s possession upon the death of a family member of the employee or the employee’s spouse or domestic partner as defined in 3 FAM 7121 or when the family member is placed into a custodial care or assisted living facility. Layette: A separate and distinct air freight weight allowance may be authorized for a newborn infant or adopted child less than 5 years of age who is a family member of an employee assigned to an overseas post where suitable layettes are unavailable locally. The shipment consists of items related to the direct care and feeding of the infant or adopted child and may include such items such as clothing, blankets, equipment and furnishings directly related to the care and feeding of a newborn child or adopted child under five years of age (i.e. crib, baby chair, car seat, etc.). Foodstuffs with the exception of milk, formula, and commercial baby food may not be shipped under this allowance. (See 14 FAM 613.4). Newly acquired family member: Employees assigned to a duty station in a foreign area. Shipment and storage of additional effects may be authorized in accordance with 14 FAM 613.2. Net weight: Consists of actual effects plus cartons, barrels, fiber drums, crates and boxes, as well the necessary wrapping and cushioning material, used to pack small or fragile articles for shipment or storage. Such articles include clothing, linens, books, pictures, mirrors, lampshades and bases, bric-a-brac, glassware, chinaware, and other small articles that normally require preliminary packing before removal from the residence. Permanent storage: See definition of nontemporary storage definition in this section. a. In accordance with Section 901(a) of the Merchant Marine Act of 1936 (46 U.S.C. 55302) any officer or employee of the United States traveling on official business abroad or to or from any of the possessions of the United States must travel and transport his or her personal effects on ships registered under the laws of the United States where such ships are available unless the necessity of the employee’s mission requires the use of a ship under a foreign flag. Provided, that the Comptroller General of the United States must not credit any allowance for travel or shipping expenses incurred on a foreign ship in the absence of satisfactory proof of the necessity therefore. b. USAID only: Although Executive Order 11223 exempts USAID from the requirements of section 901 of the Merchant Marine Act of 1936 (46 U.S.C. 55302), which requires U.S. Government employees to use ships of U.S. registry when such ships are available, USAID's policy is that U.S.-flag vessels are to be used for transporting effects unless such ships are not available or their use is not feasible (see 14 FAM 616.3). a. It is the Department's policy that a travel authorization which includes authority for the transportation of effects constitutes authority for the transportation (i.e., water, rail, air, or driven), of one motor vehicle owned by the employee or an eligible family member when such transportation has been determined to be necessary or expedient, unless prohibited by regulation or administrative action. Not more than one motor vehicle may be transported to a post of assignment, except as provided by 14 FAM 615.3, 14 FAM 615.4, and 14 FAM 615.5. (3) In cases other than those specified above in this section, an authorizing officer may determine that transportation of a privately owned vehicle is necessary or expedient. Such cases frequently occur when danger or undue hardship would be involved if the employee or an eligible family member drove the vehicle between the authorized points of origin and destination. A copy of this determination should be furnished by the traveler for submission with the travel voucher. c. Degradation of mechanical condition while in storage or shipping is the employee's responsibility (i.e., dead battery, oil leaks, etc.). (c) Perishable articles (including frozen foods) articles requiring refrigeration, or perishable plants. a. The Director, Transportation and Travel Management Division (A/LM/OPS/TTM), and/or HR/EX as the Department’s authority for appeal are authorized to deny the use of U.S. Government services and facilities in circumstances involving unusual boxing, crating, shipping, storage, and handling costs associated with personal effects and requested by the employee; or in cases when an item cannot be shipped in any normal way, such as when it does not fit in standard approved shipping containers. b. This provision includes, but is not limited to, requests to ship items of unusual size, or with special characteristics or qualities, or which are perishable, fragile, or contain hazardous material as established by international agreement; requests for more than two supplemental shipments; taxidermy or stuffed animal trophies prohibited by destination; any access and removal of effects from permanent storage or any HHE surface shipment weighing less than 200 net pounds; or multiple requests for pick-ups of personal effects from locations other than the primary residence. d. The Director, Transportation and Travel Management Division (A/LM/OPS/TTM) for State; Human Resources Manager, USFCS/OIO/OFHR for Commerce; or Chief, FA/AS/TT for USAID, will determine the extent to which these services can be denied. In such cases, employees retain the right to normal legal and administrative appeals. e. The shipment of battery-powered portable electronic smoking devices (e.g., e-cigarettes, e-cigs, e-cigars, e-pipes, personal vaporizers, electronic nicotine delivery systems) and hover-boards are prohibited in all personal-property shipments moved by air mode, e.g., unaccompanied air baggage and household effects shipments shipped by air mode. The shipment of battery-powered hover-boards is also prohibited in all other personal-property shipments and storage lots unless the item is marked with an Underwriters Laboratories (UL) certification. a. The combined shipment and storage of effects allowance has been established at the statutory limit of 8,165 kilograms or 18,000 pounds, net weight, for each employee, regardless of family status. c. A special shipment allowance of less than 7,200 pounds, net weight, applies for certain posts with limited facilities, 1-year tours, unaccompanied status, or other special circumstances. See the periodic memorandum entitled "Posts with Special Shipment Allowances for Post Assignment Travel" maintained by the Department of State’s HR Assignments Division. d. Should the actual weight in continuous storage and the estimated weight of all shipments exceed the 18,000 pound statutory limit (14 FAM 611.6-1), the weight already in continuous storage prior to the new travel authorization is the first weight credited the 18,000 pounds. The weight already in continuous storage will be calculated against the new travel authorization and the 18,000 pound statutory limit at the point any service is provided under the new travel authorization. e. Employees are encouraged to review their Travel Message 3 (TM3) for any specific recommendations or cautions on what furniture to ship to their onward post. Employees assigned to a furnished post are provided basic furniture items by the government under the Furniture and Appliance Pool (FAP) program. Given limited warehouse space, post policies may prohibit assigned FAP furniture to be removed from a residence and stored at U.S. Government expense. Employees should review the post housing policy and communicate with the general services office and community liaison office regarding shipping personal furniture to post (see 6 FAH-5 H-512.3-1 for further information). f. Storage is covered under 14 FAM 620.
a. It is the responsibility of each employee to consult with the post report and/or the post management officer to determine the restrictions and limitations, if any, that are placed upon the shipment of personally owned firearms or ammunition into the country of assignment. The post report will include the prescribed procedures that must be complied with under host-country regulations when firearms and ammunition may be imported (see 2 FAM 170). When post reports are not available, the employee, before initiating shipment of firearms or ammunition, must secure in writing authorization and approval from the chief of the diplomatic mission, or designated representative. b. The Department of State will not ship ammunition as part of an employee’s effects. Ammunition, a hazardous cargo, requires special handling and labeling. The employee should directly ship ammunition separately and consign it to an import handler. (9) Other miscellaneous expenses, not enumerated here, may be allowed when necessarily incurred in connection with the shipment of effects. Receiving posts pay for local costs incurred for receiving, handling, and unpacking pack-and-crate shipments. Through bill-of-lading shipments specify that all arrangements and payments with respect to customs documentation, packing, unpacking, local drayage (transport), and other related services will be handled by the carrier. Therefore, posts should merely inspect such shipments closely to determine that the carrier provided the services agreed upon. Posts should exercise particular care to make certain that when receiving through bill-of-lading shipments they make no payments for services rendered in connection with these shipments. Normally, the post will arrange for the unpacking and hauling of effects for delivery to the employee's residence, and will arrange for the payment of costs by the fiscal office for the post. a. If the post has reason to believe that the stated weight of an inbound shipment of household effects or unaccompanied air baggage is too high, a contractor should re-weigh the shipment upon its arrival at the post. In such cases, re-weighing provides an excellent opportunity to protect the Department or Agency from paying overcharges for packing and transportation services based on net and gross weights that prove to be incorrect. When the shipment exceeds the employee's allowance, correct re-weighing procedures are especially beneficial to the employee, who would otherwise be required to pay excess charges. b. At the time of receipt, each lift van should be weighed separately on the most accurate scale available to establish its gross weight. Following delivery and unpacking of the household effects, the lift van and any blocking and bracing material should be reweighed on the same scale to obtain the tare (empty) weight of the lift van. The gross weight less the tare weight will establish the actual net weight of the household effects as defined in 14 FAM 611.3. Cartons and wrapping or padding material should not be included as part of the tare weight of the lift van. As stated in 14 FAM 611.3, the weight of these items is part of the net weight of the household effects shipment. A weight ticket should be stamped by the weighing machine or completed by the contractor showing the gross, tare, and net weights. c. When inbound household effects or unaccompanied air baggage (UAB) shipments are re-weighed and the ticketed vice actual gross or net weight is found to be significantly higher, the shipping post must be notified of all details (including the re-weighing tickets) in order to undertake corrective measures with the contractor or carrier. If the shipment originated in the United States, the receiving post should notify the particular department or agency transportation office. d. When a UAB shipment in excess of the employee's allowance arrives at post, the contractor should reweigh it at the air carrier's terminal at time of pick-up. The air carrier's scale will probably be the most accurate and accessible for reweighing the baggage shipment. If the weight of the UAB shipment differs from the weight shown on the air waybill, the delivering airline should note the correct weight before the receiving post takes possession of the baggage. The receiving post can then notify the origin transportation office regarding the discrepancy for follow up. a. Employees relocating under official travel authorizations are responsible for any transportation, demurrage, storage, customs cartage, or other costs incurred by them, their eligible family members, or agents which are not authorized by laws and regulations governing the shipment and/or storage at U.S. Government expense of personal effects (household effects - HHE unaccompanied air baggage (UAB), privately owned vehicles (POV), and consumables (CNS)). (2) Accept their personal and sole responsibility to pay the excess costs from personal funds of any excess charges incurred for overweight or cost construct shipments (see 14 FAM 612.3-2). a. Employees must know their personal effects shipping weight entitlements and limitations. As a guide for estimating weight in future shipments, they should maintain personal records of each shipment's previous weight, including the weight(s) of any shipments in storage. Historical shipment weights and the weight(s) of any shipments currently in permanent storage may be obtained from the GSO office at post, by accessing Transportation Lite/Plan My Move, or from the Washington Transportation Office. b. The 14 FAM Exhibit 612.3-1 is a guide to assist employees in estimating the net weight of their effects prior to packing. This exhibit lists the household effects that generally comprise the majority of articles used to furnish a residence. An estimated net weight for fragile articles, which normally requires preliminary packing before removal from the residence, includes packing and crating materials (see 14 FAM 611.3). c. Furniture is variable in size and weight. Employees should exercise care in utilizing the list in 14 FAM Exhibit 612.3-1 to estimate the net weight of their effects. The figures furnished represent average weights and serve as a guide. Regardless of the estimated net weight arrived at by the use of this list, the actual net weight of the effects shipped or stored will be charged against an employee's authorized weight allowance. d. The average cubic feet per piece is furnished as an indication of the size of the article for which the weight is shown. As a general rule, 112 kilograms per cubic meter or 7 pounds per cubic foot may be used to estimate the net weight of the articles not listed. The net weight of effects shipped or stored is determined by weighing the effects on scales at the point of origin or destination, if possible. e. An additional tool available to estimate personal effects weights is the pre-move survey weight estimate performed by the transportation service provider (TSP) prior to shipment pack-out. While the main purpose of the pre-move survey is for the TSP to determine the TSP's packing and servicing requirements, the TSP representative will also provide his pre-move survey estimated weight of each shipment to the employee. Employees must note, however, that this is an estimate only, and must not assume that the estimate will be the actual, or final, packed shipment weight. The employee should utilize a combination of the TSP survey weight estimate, historical shipment weights, and knowledge of what items have been added or removed to the household since the last pack-out. In any case when a combination of these tools indicates the possibility of meeting or exceeding the authorized shipping and storage weight entitlements, employees should take action prior to pack-out to reduce the weight of their personal effects, or be prepared to pay for all excess costs due to excess shipment weight. f. Official weights for HHE, consumables and nontemporary storage shipments are recorded at the warehouse on a certified scale and are not weighed at pack-out or delivery residence. The transportation service provider (TSP) is not required to provide weighing services at pack-out residence or at the delivery address, and has the right to deny such request. (3) State and Commerce only: The cost of shipping household effects for storage to an authorized storage point (see 14 FAM 624) may not be used as the basis for a cost construct shipment of the effects to an alternate destination. In certain circumstances, exceptions to this regulation may be granted in accordance with 14 FAM 514. (6) For domestic van line shipments, any shipments that exceed the 18,000 pounds net weight limitation must be paid by the employee with no exception. Due to the nature of this transportation service, once the shipment has departed the residence, there will be no opportunity to remove items as the shipment is en route directly to next destination. (5) These weight allowances are not reduced when an employee ships excess luggage, unaccompanied air baggage, and/or a motor vehicle pursuant to 14 FAM 613.3 and 14 FAM 615. However, the weight of automotive replacement spare parts or supplies such as tires, motor oil, windshield wiper fluid, batteries, and any other accessories is chargeable against the total weight allowance (see 14 FAM 612.3-2, subparagraph b(3), regarding loss of effects). (4) An employee retiring or separating from the Foreign Service is authorized to ship from their current assignment and from storage locations where they possess property stored at U.S. Government expense. However, the employee may cost-construct any remaining weight not shipped from post up to the authorized weight amount from post, e.g., 7,200 pounds from a limited shipment post. The employee is not authorized to ship personal effects from other locations, even if the employee has unused weight allowances under the 18,000 pound statutory limit. a. When a change in family status occurs which would authorize the shipment of household effects, the effects may be shipped either from the employee's former post or the United States to employee's current foreign duty station. b. State and Commerce only: Officers assigned to domestic tours do not qualify for shipment of effects for an eligible family member (EFM) acquired during the domestic tours. c. Employees assigned to a duty station in a foreign area who acquire a family member (see 14 FAM 611.3 for the definition of "eligible family member") subsequent to the issuance of assignment travel orders may be authorized travel expenses for the family member notwithstanding the time limitation specified in 14 FAM 584.2. Shipment of effects of the newly acquired family member will be authorized from either place of acquisition or residence. (Proof in either case is required.) Shipment and storage of additional effects may be authorized. b. The unaccompanied air baggage weight allowance is in addition to the household effects weight allowance shown in 14 FAM 613.1. Unaccompanied air baggage is shipped as airfreight by the most direct route between authorized points of origin and destination, regardless of the modes of travel of the employee and EFMs. c. Unaccompanied air baggage is considered to be personal belongings needed immediately by the traveler upon arrival at his or her destination. Therefore, the transportation of unaccompanied baggage must be initiated promptly, preferably in advance of the traveler's departure. Shipment of UAB must be initiated within 30 days of the last traveler's arrival at the final destination. Unaccompanied baggage shipped from the losing post is limited to the traveler's unaccompanied baggage weight authorization. Unaccompanied baggage shipped to the gaining post is limited to the traveler's unaccompanied baggage weight authorization. d. Unaccompanied air baggage is not authorized for TDY travel unless specifically authorized in the travel authorization or when such TDY travel is in conjunction with travel on direct transfer, home leave, or home leave and transfer, in which case unaccompanied baggage may be shipped between points specified in such authorization. e. The UAB weight allowance is not applicable for a newborn child when an employee is granted a layette weight allowance in accordance with 14 FAM 613.4. In such cases, the normal increase in the unaccompanied baggage allowance will be effective when the next travel authorization is issued and authorizes travel of the family. f. Unaccompanied air baggage is authorized for travel against the involuntary or voluntary separate maintenance allowance (SMA) travel authorization. g. Tri-wall cartons containing airfreight shall not exceed 15 cubic feet (0.424 cubic meters), 200 pounds (90.90 kilograms) per carton, and dimensions of 37 inches by 30 inches by 23 inches (0.9398 meters by 0.762 meters by 0.5842 meters). h. For shipment of UAB on a cost-constructive basis, (see 14 FAM 612.3-2 and 14 FAM Exhibit 613.3). i. For shipment/storage of UAB in conjunction with educational travel see 4 FAM 469.1.
a. For the unaccompanied air baggage (UAB) shipment, the employee should consider only those items that will be required immediately upon arrival, such as clothing, toiletries, pots, pans, unbreakable dishes, sheets, blankets, and essential light housekeeping articles. Airfreight is not meant to include large household items such as furniture, room-sized rugs, TV sets, major appliances, or any item that exceed the standard measurements and weights of 15 cubic feet (0.424 cubic meters), 200 pounds (90.90 kilograms), and dimensions of 37 inches by 30 inches by 23 inches (0.9398 meters by 0.762 meters by 0.5842 meters). Fragile items that may be damaged by rough loading and unloading should not be sent by airfreight. Liquids, including alcoholic beverages, are prohibited in UAB shipments. b. UAB shipments are measured by gross weight. Gross weight is the net weight of the shipment plus any outside containers and bracing required by the packers or airlines. It is recommended that 5-10 pounds per box in the UAB be allowed for this purpose. If the weight limit is exceeded, the employee must resolve the overweight problem or pay for the excess before the shipment will be moved. c. Unaccompanied air baggage is a separate allowance from HHE shipping and storage. Any unused airfreight weight cannot be added to the household effects (HHE) shipment and storage allowance. a. A separate and distinct air freight weight allowance for the shipment of a layette may be authorized in an amount not to exceed 113 kgs. or 250 lbs. gross weight for a newborn infant or adopted child less than 5 years of age who is an eligible family member of an employee assigned to a post (and who has arrived at the post) where suitable layettes are unavailable locally and must be obtained in the United States or its territories (Puerto Rico, U.S. Virgin Islands, Guam, American Samoa, and The Commonwealth of the Northern Mariana Islands). b. See definition of layette in 14 FAM 611.3 for allowable layette items. c. An air shipment may commence 120 days before the expected birth, but no later than 60 days after the birth of a child. For an adopted child, an air shipment should commence no later than 60 days after the adoption. The time limitations specified in 14 FAM 584.2 are not applicable to this allowance. On subsequent travel involving authorization for transportation of air freight, the family and new child will receive weight allowances as set forth in 14 FAM 613.3.
d. Items shipped in the layette may not exceed the dimensions of a standard tri-wall carton of 37 inches by 30 inches by 23 inches (0.938 meters by 0.762 meters by 0.5842 meters). Exceptions (e.g., baby cribs) that exceed these dimensions may be approved by the Director, Transportation and Travel Management Division (A/LM/OPS/TTM), and/or HR/EX. e. Travel authorizations for State Department personnel may be amended to include authorization for the layette shipment. The request for amendment should be cabled to the attention of HR/EX/ASU certifying that the post has determined suitable layettes are not available locally (see 14 FAM 523.2-1, subparagraph f(2)(e)). f. Layette shipments for Commerce should be sent to USFCS/OIO/OFSHR. g. Layette shipments for USAGM should be sent by the traveler to his or her Washington, DC headquarters office. Alcoholic beverages within the free entry import limitations prescribed by the Treasury Department must accompany the traveler and may not be shipped as unaccompanied baggage (see 14 FAM 618.3). a. When the Office of Allowances (A/OPR/ALS) designates a post as one at which conditions make it difficult to obtain locally the consumables required by employees and their eligible family members, an authorizing officer must authorize a separate weight allowance for the shipment of consumables, in addition to the HHE weight allowance. Posts with consumables shipments authorized are listed in the Consumables List Alphabetically by Post on the A/OPR/ALS website: Office of Allowances. b. Consumables are limited to foodstuffs for human consumption (with the exception of pet food or kitty litter) or items used for personal or household maintenance such as toiletries and nonhazardous cleaning supplies. Consumable shipments may not include household effects (HHE) or items used for the care and maintenance of vehicles; however HHE shipments may include consumable items. A summary of HHE items can be found in 14 FAM 611.5.
c. The weight allowance for shipment of consumables has been established at 1,134 kilograms or 2,500 net pounds for a 2-year tour and 1,701 kilograms or 3,750 net pounds for a 3-year tour for each employee, regardless of family status. Some posts with 1-year tours have a lower weight allowance for shipment of consumables: See the periodic memorandum entitled "Posts with Special Shipment Allowances for Post Assignment Travel" maintained by the Department of State’s HR Assignments Division. (3) The above 1- and 2-year time limitations may be extended with full justification. Request for extension and amendment to the assignment orders must be approved by the appropriate authorizing official in advance of any shipment. (4) An employee with a 2-year tour is allowed up to three consumable shipments, i.e. an initial plus two supplemental shipments. An employee with a 3-year tour is allowed up to four consumable shipments, i.e. an initial plus three supplemental shipments. e. Perishable or frozen foods may not be contained in a consumables shipment. f. The minimum consumables shipment weight is 200 net pounds. NOTE: For additional consumables weight allowances at selected special shipment posts, see the periodic memorandum entitled "Posts with Special Shipment Allowances for Post Assignment Travel," maintained by the Department of State’s HR Assignments Division. a. The intent of the consumables weight allowance is to recognize the extreme conditions at specific posts and to provide employees with adequate consumables. b. In order for a post to be designated as a “consumables post,” a post must have limited availability of consumables with items being extremely difficult to obtain locally; cannot be obtained from the closest source of supply such as a neighboring country; locally available goods are of substandard quality; host-government importation policies severely restrict or prohibit import of consumables; or there is no means of establishing group orders or the size of the mission is too small to support a commissary or group order; e.g., goods cannot be shipped in sufficient quantity to meet minimum shipping requirements. c. The Office of Allowances (A/OPR/ALS) review and decision will be based on the most recent Post Consumables Survey (Form DS-267-A) which posts submit to A/OPR/ALS. Surveys must be certified as accurate, complete, and current by the person primarily responsible for coordination and preparation of the report. a. All consumables weight allowance posts are required to submit a new justification every 2 years. For justification renewals, Post Consumables Surveys (Form DS-267-A) are to be forwarded to the Office of Allowances, A/OPR/ALS, based on the Post Differential Questionnaire reporting schedule found in the Department of State Standardized Regulations (DSSR) Section 920. A/OPR/ALS will send a courtesy reminder to post. b. A post may submit a new justification for review at any time that conditions at the post change. c. An employee assigned to a consumables post is not affected if the post is deleted from the list of designated posts (see A/OPR/ALS). When a post is added to that list, all employees with more than 1 year remaining in the tour of duty will qualify for a consumables weight allowance. NOTE: An employee is considered assigned to a consumables post for purposes of 14 FAM 611.5 and 14 FAM 613.6 once that employee has been paneled and an official assignment has been made. a. Transportation of household effects/unaccompanied air baggage (HHE/UAB) is authorized when family members are eligible to receive a Separate Maintenance Allowance (SMA) grant under the Standardized Regulations (SR), Section 260, subject to the rules below. b. U.S. origin point HHE/UAB: Upon the approval of an employee's initial election of SMA when transferring from the United States to a foreign post of assignment, HHE/UAB may only be shipped if the authorized SMA location is different from the employee's point of origin. Shipping weight to the SMA point combined with the weight of employee's shipment to a new assignment and the amount in storage may not exceed the combined, authorized shipping and storage allowance(s) permitted in the employee's travel authorization. c. HHE/UAB transfers between foreign locations. Upon approval of the initial election of SMA when an employee is transferring between foreign posts, HHE/UAB may be shipped from the losing post to the authorized SMA location in the United States. If the initial election is for the family members to travel to the new post from an authorized SMA location, HHE/UAB may be shipped from the location in the United States to the gaining post. The total shipping weights must not exceed the employee's authorized HHE/UAB weight allowance. When an alternate SMA location is selected in a foreign location for family member(s) the employee is responsible for paying any excess transportation of HHE/UAB charges on a cost-constructive basis from the authorized SMA point. When the SMA grant of the family member(s) terminates in a foreign country due to an employee's subsequent foreign assignment, the employee will be responsible for paying any additional costs to the onward location. (2) When the SMA grant terminates during a tour of duty at a foreign post, HHE may be shipped from the authorized SMA location in the United States to post up to the employee's remaining shipment allowance. e. If the employee elects SMA at the time of transfer to a limited shipment (furnished quarters) post from a full shipment (unfurnished quarters) post, shipment of HHE to the authorized SMA point is not restricted to the limited shipment allowance. All shipments combined, including any amounts in continuing storage, must not exceed the limits established in 14 FAM 613.1. Employees' liabilities are established in 14 FAM 612.3. Whenever money can be saved by doing so, ship effects on a through-bill of lading rather than to an intermediate point for transshipment. a. Non-through-bill of lading HHE shipped by surface and originating from the United States is forwarded by U.S. Despatch Agencies to posts. Transportation offices of the State Department and USAID issue packer authorizations (PAs) to transportation service providers to perform packing services. These PAs allow service providers in the United States to pack and pick up HHE shipments from the employee's residence or vendors, and load the HHE into wooden lift vans that meet Department specifications. These lift vans become the property of the U.S. Government. Transportation offices are responsible for ensuring that export HHE shipments are made available in a timely manner, and that the appropriate U.S. Despatch Agent is advised to move the shipment to post. The various agency transportation offices monitor and control the shipment until it is pulled by the appropriate Despatch Agency. The U.S. Despatch Agency receives and books the HHE shipment onto a vessel for forwarding to the post. b. The mission or post can obtain shipment status by accessing the Transportation Lite (T-Lite) module in ILMS. Additional assistance is available from the responsible transportation office or servicing U.S. Despatch Agency. c. When status is required for the shipment of a privately owned vehicle (POV), posts and missions abroad should inquire directly of the U.S. Despatch Agency to which the employee submitted the automobile shipping form. For employee shipments originating in localities more than 50 miles from Washington, DC, the Department will select a firm to export-pack, store, and provide related services in the locality. (2) USAID: Travel and Transportation Management Division (M/SER/MO/TTM). b. When the Department has contracts or price arrangements with designated packers, forwarders, carriers, or other firms, payment for authorized services performed by those firms is an allowable expense. If other firms are used at the request of employees and pre-approved by the Chief, A/LM/OPS/TTM, they are responsible for all excess costs involved, and must make personal arrangements with the firm or firms selected (14 FAM 618.2). Allowable expenses are limited to actual expenses incurred, not exceeding the amount that the U.S. Government would have paid under its contract or other price arrangements. When two or more firms have been approved to perform a particular service, reimbursable expenses are limited to the average price of the approved firms. The Department or the Agency will issue the necessary documents to the firm or firms that will perform the required services. Letters of authorization will not be issued to cover preparation for export shipment of newly purchased items that include a markup to cover export packing. Employees must personally pay these charges and submit a reimbursement voucher supported by receipted invoices. UAB shipments from the United States are controlled by the transportation office of the employee's agency or State (A/LM/OPS/TTM). If State prepares the documentation for an employee of another agency, an En Route Notification is forwarded by State or the agency's transportation office, to the employee's post of assignment, citing the air waybill number, weight and cube, number of pieces, and UAB airline shipping date (based on information from the packer). If the UAB does not arrive within a time frame determined normal, the GSO at post can initiate tracer action. Requests for status or tracer action should be sent to the transportation office of the employee's agency and not the U.S. Despatch Agency. a. Shipments originating at one of the U.S. Despatch Agencies and bound for ELSO-serviced posts utilize U.S.-flag steamship companies that normally discharge at the Ports of Rotterdam and Bremerhaven. The U.S.-flag steamship companies then deliver the cargo and containers by truck to their terminals located in Antwerp and Bremen at which point ELSO takes receipt of the shipments. The U.S. Despatch Agent provides ELSO and the destination post with advance shipping information in the form of the En Route Notification. Packing lists and other shipping documentation should be available in the ILMS record. The average transit time from the U.S. east coast to receipt of the shipment at ELSO's facilities ranges from 17 to 20 days. b. Once a shipment is in its possession, ELSO arranges for the onward movement of the shipment to the consignee. ELSO inspects arriving shipments against the shipping documents to ensure the total number of pieces shipped have actually arrived. When necessary, ELSO repairs and/or repacks shipments. If applicable, claims are filed with the parties responsible for damages. As soon as shipments are booked, ELSO advises the destination post by an En Route Notification with shipping details. Posts should immediately notify ELSO of a shipment's arrival or nonarrival to allow ELSO to begin tracing action on missing shipments, make payment of shipping charges, and update and close ELSO shipping files. c. Destination posts should take into consideration unavoidable delays, (i.e., delayed arrival of carrier, bad weather, inaccessible road transportation, customs problems, etc. ), before requesting the status of household and personal effects shipments transiting ELSO. Posts should allow at least 20 days from the actual departure date of the shipment from the United States before asking ELSO about transshipment information. NOTE: When requesting information for any shipment, posts should refer to either the U.S. Despatch Agent or ELSO shipment number, if known. (6) Import restrictions, if any, on certain commodities; e.g., alcoholic beverages, firearms, automobiles. (5) Ensure that a complete and proper inventory is prepared that describes the shipped articles and their condition, and does not include any articles described as “packed by owner (PBO)” or “contents unknown,” which will cause delays in customs clearance and may also result in excess costs. (3) Any other documents necessary for clearance and forwarding of the shipment. b. When effects are consigned to a U.S. Despatch Agent for onward shipment to another post, an En Route Notification should be sent by the losing post to the gaining post with an information copy to the U.S. Despatch Agency and to the employee's agency transportation office. (3) By negotiation under the authority of FAR 48 CFR Part 15.
b. Posts should establish reasonable service standards for the proper protection of effects to ensure high quality service. Post should contact the Office of the Procurement Executive (OPE) Evaluation and Assistance Division for contract templates. a. The arrangements made for packing and shipping household effects would be influenced by the size of the post, the type of quarters provided, and the presence of other foreign affairs agencies’ programs, which increase the number of persons the post assumes responsibility for servicing. b. Posts should estimate their packing, crating, and shipping requirements based upon anticipated normal transfer of personnel that will occur during a 12-month period. If the estimated volume of services is expected to exceed $25,000 each year, give consideration to the establishment of a contract in accordance with FAR 48 CFR 16.503, requirements contracts or 48 CFR 16.504, indefinite quantity contracts. If the estimated volume of services is expected to be $25,000 or less each year, it may be more appropriate to obtain the services (case-by-case) in accordance with one of the small purchase or other simplified purchase procedures set forth in FAR 48 CFR Part 13.
a. Solicitation for services: Competitive solicitations shall be used to the maximum extent practicable consistent with the requirements of FAR 48 CFR 13.106-1 (b) for small purchases, and FAR 48 CFR 6.100 for procurements estimated to exceed $25,000. Once a post establishes its requirements, it must develop specifications that promote full and open competition, and must prepare a solicitation document that sets forth the responsibilities of the bidders or offerors as well as the resultant contractor. FAR 48 CFR 13.101, 48 CFR 14.201, and 48 CFR 15.406 provide requirements for the preparation of solicitations and documentation. b. 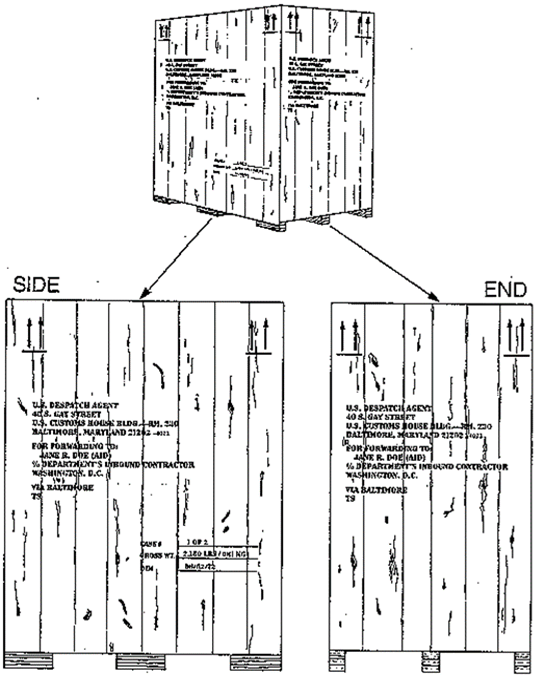 Ownership of containers: In the pack-and-crate method, the shipping container and the packing materials furnished by the contractor become the property of the U.S. Government. The destination post takes title and control over the shipping containers, cartons, and packing materials after the shipment is delivered and unpacked. All posts should try to salvage incoming containers received in good condition. The vans originating from Washington, DC, are well-made and designed with removable doors to facilitate their reuse, allowing posts to obtain an appropriate reduction in packing charges by furnishing vans to their contractors. Shipping containers and packing materials used for shipment of effects by the through bill-of-lading method will remain the property of the carrier or its agent. a. Pack-and-crate method means that the U.S. Government arranges for the export packing, local transportation, ocean shipment, and other services necessary to deliver effects to the employee's residence at destination. (6) Delivery and unpacking at residence. c. To properly evaluate costs, the receiving post should obtain current destination charges at Washington, DC or other posts to which through bill-of-lading rates are being considered. d. 14 FAM Exhibit 614.5 illustrates the method a post should employ in computing its pack-and-crate costs. The basic information on packing factors and tare ratios should be developed from the post's own records, using the exhibit as a step-by-step instruction. The origin and transportation costs can be easily and accurately determined for comparison with rate quotations of through bill-of-lading carriers. a. The International Through U.S. Government Bill-of-Lading (ITGBL) Program is the preferred personal property shipment method and will be used for shipments between posts and the United States and for post to post shipments, except for posts with unique circumstances , such as nonavailability of ITGBL rates, ITGBL rates that are not cost-effective, or reduced or restricted shipping allowances. A/LM and HR/EX, with post input, will document and justify exclusion from ITGBL participation. b. The program provides all-inclusive shipping services for personal property during a transfer, based on a negotiated price and delivery date under the control and responsibility of a single transportation service provider. It entails only one bill-of-lading and the processing of a single voucher. The ITGBL forwarder or his agent will work directly with the employee for information required on customs documentation for shipments returning to the United States. (9) Unpacking of effects and placement in residence. NOTE: Charges for any additional accessorial charges (Storage-in-transit (SIT), specialty crating, special lifting, etc.) will be billed as a separate charge and must be pre-approved by the responsible transportation office or servicing U.S. Despatch Agency. The Transportation and Travel Management Division (A/LM/OPS/TTM) is the supporting office for most Canadian posts. a. There are posts where the ITGBL shipment method cannot be used due to post’s unique local circumstances, or due to nonavailability of ITGBL rates, ineffective ITGBL rates, or reduced or restricted personal effects shipping allowances. Exclusion from the program requires posts to provide a justification to the Transportation and Travel Management Division (A/LM/OPS/TTM) detailing the service and cost obstacles. The division will then work with commercial industry to overcome the obstacles, excluding the post from participation until the issue(s) are resolved. b. ITGBL service is limited to household effects (HHE), consumables (CNS), unaccompanied air baggage (UAB), and privately owned vehicles (POV). c. The required minimum weight for an ITGBL shipment is 1000 net pounds. This can be HHE only, consumables only, or a combination of HHE and consumables. The minimum UAB shipment weight is 100 gross pounds. a. Claims are filed directly with the forwarder. ITGBL service provides full replacement liability for loss or damage up to the maximum liability of $8.50 times the net weight of the shipment or the blue book value of privately owned vehicles (POVs). ITGBL claims are generally settled within 30 days from date of filing with the freight forwarder. b. Documents are issued by the servicing Despatch Agency. Posts are not required to issue any shipping documents. c. Lower cost is generally achieved with the ITGBL for household effects (HHE), and ITGBL is generally the best value when compared to cost of the direct procurement method. This does not mean that it is always the best or most economic method of transporting a particular shipment. The Despatch Agency servicing a post will carefully compare ITGBL and direct-procurement method rates to determine best value to the U.S. Government. In addition, A/LM/OPS/TTM/TM will monitor transportation lanes to ensure use of cost effective shipping methods and will recommend changes accordingly. d. Overseas local agents are solicited annually in February by the Transportation and Travel Management Division of the Office of Logistics Management (A/LM/OPS/TTM). TTM will ask posts to provide a minimum of three (if available) preferred local transportation service providers or agents that can provide packing/ and unpacking services on behalf of a forwarder. Local destination agents selected by post need not be under contract to be used under the ITGBL program. All ITGBL forwarders must submit their tender offers based on using post’s list of recommended local transportation service providers or agents. Posts should send their list of preferred local transportation providers or agents in order of preference to A/LM/OPS/TTM/TM via cable, or by email to TransportationQuery@state.gov or by fax at (202) 663-0981 attn: ITGBL Coordinator. More information on selecting local agents can be found in 14 FAM 614.5-7.
e. Quality control oversight of the quality of packing and unpacking services is managed by post through involvement in selecting the local transportation service providers or agents. Local transportation service providers or agents who provide poor service can be removed from the local pool as necessary. Removals must be coordinated prior to removal with the ITGBL coordinator in A/LM/OPS/TTM/TM. f. Website tracking of shipments is available through ILMS status tracking, or by using “Where's my shipment?” available at or using the forwarder’s tracking website (password controlled) that is provided by the forwarder to each relocating employee. g. En Route Notices via email to post are issued by both the forwarder and the Department. h. Payments to local transportation providers or agents are handled by the forwarder, reducing paperwork at post. a. Post or the employee must enter the shipment request pack-out into Transportation Lite for review by their servicing Despatch Agency listed in 14 FAM 614.5 to request booking for an ITGBL shipment. b. Employee must coordinate with the ITGBL forwarder to provide data for U.S. Customs forms or supplemental shipment forms for household effects or UAB shipments. POV shipments will require the employee to complete a Form JF-49, Vehicle Shipment, for the forwarder and provide a front-and-back copy of the title or other document to prove ownership. d. For pack outs from the United States to post, the forwarder’s selection is fully automated based on best rates and performance. The employee’s Washington, DC based transportation counselor issues the U.S. Government bill-of-lading (GBL) and performs the same functions as the Despatch Agency in paragraph c of this section. For assistance with any questions concerning the International Through U.S. Government bill-of-lading (ITGBL) program, please contact the Despatch Agency office supporting your geographic region. Consult the table below. Despatch European Logistical Support Office (ELSO) handles ITGBL shipments from Europe (EUR), Africa (AF), Near East (NEA), and the following posts in South and Central Asia ((SCA): Tajikistan, Turkmenistan, Uzbekistan, Kyrgyzstan, Kazakhstan) and from post-to-post in these regions. DA Seattle handles ITGBL shipments from the following posts in South and Central Asia ((SCA): Afghanistan, Pakistan, Bangladesh, Bhutan, India, Maldives, Nepal and Sri Lanka), East Asia and Pacific (EAP), and Vladivostok. DA DC handles all outbound ITGBL shipments from the United States as well as shipments from the United States to Canada and Mexico and all domestic U.S. shipments. (4) Loading: Be certain that effects are properly stowed and distributed within the container. b. All space between cartons and pieces in the shipment should be filled by the insertion of cushioning material or dunnage to keep the load tight and to prevent it from shifting within the container. Heavy items should be placed on or near the floor of the lift van, not placed on top of lightweight and/or easily crushed items. Post's GSO should inspect all potential Local Agents to ensure there is adequate equipment, facilities and support staff. 14 FAM Exhibit 614.5-7 is an example of an inspection checklist that may be used. a. Post does not need to have a contract with the company to designate them on the Local Agent list mentioned in 14 FAM 614.5-5.
b. The service agreement will be between the contracted ITGBL service provider and the local agent. (1) Facilities: Ensure the facilities are of sound construction that can properly protect shipments from inclement weather. Facilities should be secure with proper safety measures in case of fire. Review the condition of the warehouse for organization, cleanliness and proper rodent prevention. (2) Equipment and supplies: The company should demonstrate the capability to provide adequate amount of new supplies to cover the volume of personal property or POV shipments arriving to and departing post. Supplies must meet all FAM and customs requirements. The company must have triwalls measuring 5, 10 and 15 cuft for UAB shipments (14 FAM 613.3-1) and new ISPM certified liftvans for HHE shipments. The company should have adequate amount of trucks, portable scales for UAB shipments and a certified scale to weigh shipments at their warehouse. The scale must be calibrated and certified every 12 months at a minimum. (3) Support staff: The company should demonstrate capabilities to support post and the ITGBL service providers with regular status updates, coordination of movements and customs clearances. a. The U.S. Despatch Agent must arrange for clearance through U.S. Customs for HHE shipments. Clearance will only be made for those shipments which conform to regulations. After clearance processes are completed, shipments will be forwarded to an approved inbound contractor for Washington, DC or a firm selected by the transportation office of the employee's agency. It is the employee's responsibility to contact his or her agency's transportation office to determine the name, address, and phone number of the packing firm receiving the inbound HHE shipment, and to contact the firm for arranging a date and time to deliver and unpack the HHE shipment. PS or TS (permanent or temporary storage awaiting delivery/unpacking). a. When HHE shipments are destined for the United States by a through bill-of-lading carrier, the employee must in all cases complete a U.S. Customs Form 3299, Declaration for Free Entry of Unaccompanied Articles (Form CBP-3299). The GSO will give the completed form to the local agent of the through bill-of-lading carrier for transmission to the carrier's customs broker at the U.S. port of entry. Completion of this form is essential to avoid delays when the shipment arrives in the United States (see 14 FAM 614.5-5). b. In some cases, as requested by the clearing U.S. Customs officials, employees will be required to provide a copy of their official passport. c. When shipments destined for the United States are made by the pack-and-crate method, a Form CBP-3299 is not necessary as the shipments are consigned directly to the U.S. Despatch Agent for clearance. a. Direct payment for cost of local cartage, delivery, and unpacking on behalf of employees will be made by the Department or Agency for employees who are assigned to the Washington, DC, area, who plan to reside and who have shipments terminating within a 50-mile radius of Washington, DC. This procedure, however, is not applicable to effects held in the Washington, DC area in loose storage, nor does it affect incoming motor van movements. b. Authorizing services: The Department or agency will issue an order to the contractor allowing for performance of in-transit storage, local cartage, and unpacking services. At the time of delivery to residence, the contractor will unpack and place all effects in the employee's residence as directed by the owner or the owner's representative. Packing materials and shipping containers, except metal or special type vans that are the property of another firm, become the property of the contractor. c. Employees who have any doubt whether or not the destination of their HHE shipment lies within a 50-mile radius of Washington, DC should contact the Department's Travel and Transportation Management Division (A/LM/OPS/TTM). The U.S. Despatch Agency responsible for clearing HHE shipments terminating in the United States (see definition in 14 FAM 511.3) beyond a 50-mile radius of Washington, DC (in conjunction with the employee's agency's transportation office) will select an appropriate local moving firm near the employee's ultimate destination. The firm will receive the HHE shipment from the motor freight carrier bringing it from the U.S. port of entry and will be temporarily held until the employee calls to arrange for a delivery date and time. The Department or agency will make direct payments to the local moving firm for delivery, unpacking, and removal of all debris for items that the firm unpacked. a. Shipments of unaccompanied air baggage (UAB) destined for the Washington, DC metropolitan area on direct flights to Washington's Dulles International Airport only, are to be marked, consigned, and prepaid directly to the Department's Travel and Transportation Management Division (A/LM/OPS/TTM). Air shipments of UAB destined for areas of the United States other than the Washington, DC metropolitan area should be marked, consigned, and prepaid to the appropriate U.S. Despatch Agent based on the U.S. gateway designated in 14 FAM Exhibit 614.6-5. NOTE: The air shipment is to terminate at the U.S. gateway designated in 14 FAM Exhibit 614.6-5. The U.S. Despatch Agent will arrange for customs clearance and issue a new GBL to forward the air freight to the ultimate destination. The employee's name (and agency), destination address, telephone number, and appropriate fiscal data must be typed in the "Nature and Quality of Goods" section of the air waybill. A complete and legible inventory of the UAB or HHE shipment must accompany the shipment in a waterproof pouch on the number one piece or box. The inventory must be in English, or have an accurate translation attached. (2) On arrival, notify the U.S. Despatch Agent (place address and telephone number of appropriate U.S. Despatch Agent here from list found in 14 FAM Exhibit 614.6-5) to arrange customs clearance. EXCEPTION: If there are nonstop (i.e., direct) flights from employee's area to one of the approved U.S. gateways other than the one listed for employee's area and this U.S. gateway is closer to the employee's ultimate destination, the GSO should route the air shipment to the alternate U.S. gateway. There the U.S. Despatch Agent will issue a new U.S. Government bill of lading (GBL) and forward the shipment to the ultimate destination. UAB arriving at Dulles International Airport for the Washington, DC metropolitan area and will be collected by one of the Department's inbound delivery contractors for delivery to the employee's residence. c. If the employee has a bona fide delivery address and telephone number before departing from post, they should be typed on the air waybill and a cable notification to State (A/LM/OPS/TTM) and to the appropriate U.S. Despatch Agency. If the destination is outside the airline delivery area or the airline cannot telephone the employee or employee’s agent to arrange for a delivery, the UAB shipment will be turned over to the inbound delivery contractor in Washington, DC or a local moving firm at the final destination for delivery to the employee's residence. d. To ensure the clearance of effects through U.S. Customs with minimal delay, the En Route Notification for air freight en route must be sent when the losing post initiates the shipment. Copies of the notice should go to the U.S. Despatch Agent or the Department's Travel and Transportation Management Division (A/LM/OPS/TTM) with an information copy to the employee's agency, if other than State. f. U.S. Customs regulations require that the U.S. Despatch Agent submit a detailed packing list and inventory with the U.S. Customs Form CBP-3299. g. Failure to provide the packing list and inventory may delay the shipment from being cleared (in some instances, for 2 to 3 weeks), inconvenience the employee, and result in increased cable traffic, storage charges, and unpacking and examination charges. If the shipment transits ELSO, the post should forward the packing list and inventory to ELSO-Antwerp. ELSO will forward the documents to the appropriate U.S. Despatch Agent at the time the shipment is forwarded to the United States. a. Alcoholic beverages, international through U.S. Government bill-of-lading (ITGBL) shipments and nonconforming personal vehicles for all U.S. Government employees may not be sent through the U.S. Despatch Agent. b. Shipments of household effects and personal vehicles for military service members and Department of Defense (DoD) civilian employees may not be sent through a U.S. Despatch Agent unless permission to do so is specified in a current memorandum of agreement or memorandum of understanding between the Department and DoD regarding shipment of personal vehicles or household effects. c. See 14 FAM 618.3-1(C) regarding shipments of alcoholic beverages and foodstuffs. a. Overview: ELSO is part of the State Department Office of Logistics and has been designated as a Regional Logistics Center (A/LM/OPS/RLC). ELSO is both an origin point for shipments from overseas missions and a through point for those shipments that are received from the U.S. Despatch Agencies for on forwarding to their final destination in Europe, Africa, the Middle East and other places worldwide. ELSO also returns shipments to the United States and destinations worldwide and is an authorized point for long term storage of personal effects as well as emergency storage for personally owned vehicles. b. ELSO is located at the port of Antwerp and also receives cargo coming in via the ports of Rotterdam and Bremen. This cargo goes to the Consolidated Receiving Point (CRP) which is a commercial, contractor’s facility for receipt and handling of personal effects and supplies for the account of the U.S. Government. (4) Unless no other routing is available to the post, do not consign UAB shipments to ELSO for transshipment. NOTE: ELSO is the consignment address and not the delivery address. NOTE: All shipping documentation should be forwarded directly to ELSO Antwerp. i. Marking cargo: Lift vans for personal effects should be clearly marked with the consignment address, employee’s name and ultimate destination as designated by the gaining post. Marking should be legible and complete, preferably stenciled or indelibly labeled (no paper labels glued or stapled on vans). Lift vans with previous markings should have the old markings obliterated so that only the current marks are visible to avoid confusion on receipt at the CRP or possible misshipment. Shipments for permanent storage should be clearly marked as such. j. Notification: Shipments inbound to ELSO requires advance notification from shipping posts or U.S. Despatch Agency offices via the En Route Notification. Advance notification with accurate and complete information is essential so that a computer file can be created for tracking and shipping cargo. Packing lists (in English), shipping documents and other pertinent paperwork should be forwarded to ELSO via the quickest means possible. Notification telegrams should provide all information as shown in the format and be for one employee and one shipment type. Posts should provide as much detail as possible (e.g., a motorcycle is included in household effects (HHE) shipment; consumables are being shipped as HHE, etc.) in the comments section. k. When shipments are outbound, ELSO sends advance notification (pre-advice email) to serviced posts to advise receipt of personal effects and/or supplies and to request forwarding instructions for export. ELSO sends pre-advice emails to posts based on their request for them and their requirements. Once export arrangements are made by ELSO, a Notification of Shipment En Route to post email is generated to provide the receiving post with status and export details of shipment(s). l. Receipt of cargo: All cargo handled by ELSO is received at the CRP facility warehouse and the contractor is responsible for receipt of the correct number of pieces and for noting any overages, shortages or damages on items received. A more detailed report is completed when personal or official vehicles are received at the CRP. When necessary, ELSO has minor repairs done on boxes, crates and lift vans or has shipments re-packed for shipment or storage. If applicable, claims are filed with the parties responsible and/or ELSO assists in providing supporting documentation for claims action. NOTE: SDDC vehicle shipments are for DOD personnel assigned to the embassy and are shipped in the same way as DOS personal vehicles except that post must contact ELSO for funding to ship POV and not use fiscal data from member’s orders. NOTE: POV shipments may be made under ITGBL but post should check and confirm with ELSO to insure that the move is cost effective. (c) Copy of diplomatic passport ID pages. When lift vans are not used and different freight rates are applicable to various goods comprising the effects, posts should package and describe the effects to permit utilization of a lower rate or combination of rates. a. Size: For shipment or permanent storage of HHE wooden or plywood lift van, maximum dimensions should not exceed eight (8) feet in length, six (6) feet 10 inches in height, and six (6) feet in width. These measurements are necessary for proper and safe handling of lift vans at piers and warehouses. The limitations ensure that lift vans fit into steamship containers wherever this service is provided by the ocean carrier. (6) Please also note that exotic plant pests have been linked to the importation of SWPM. These pests are a serious threat to agriculture and natural, cultivated, and urban forests in the United States and other countries. For this reason, globally accepted measures are being applied to eliminate the risk for pests associated with the SWPM. The International Plant Protection Convention website provides the name of the official in each foreign country who can provide a list of approved contractors that can provide appropriate fumigation and other pest control measures. a. Voluntarily abandoned personal effects: Personal effects are considered voluntarily abandoned when the owner of the property intentionally and voluntarily gives up title to such property and title vests in the U.S. Government. The owner must provide a receipt of the property to the post, post-supported Despatch Agency or the Director, Transportation and Travel Management Division, to show the property was voluntarily relinquished. All correspondence to include the receipt of the property must be attached to the Integrated Logistics Management System (ILMS) shipment record. Once the property is voluntarily abandoned, the employee forfeits their right to file a claim on any of the property and the U.S. Government may proceed with disposal of the property. (3) The employee forfeits the right to file a claim 75 calendar days from the date storage expires (i.e., receive any compensation). If the owner attempts to file a claim on the personal effects that were disposed of, the value will not exceed the depreciated value of the items at the time of disposal minus any additional storage costs the Department incurred for storage time beyond the authorized storage entitlement. a. The cost of transporting a motor vehicle is allowable only when the privately owned vehicle (POV) is owned by the employee or an eligible family member. Except as provided in 14 FAM 615.3, 14 FAM 615.4, and 14 FAM 615.5, no expenses are allowed in excess of the cost of transportation between the authorized points of origin and destination, or between the factory site and the authorized destination, whichever involves the lesser cost. b. Shipment of a POV between domestic origination and domestic destination points in the continental United States (CONUS) may be authorized on a case by case basis when it is determined to be advantageous to the U.S. Government or that travel by POV would be dangerous or cause undue hardship. (4) The shipment is not otherwise prohibited by law or regulation. (3) When an alternate ISMA location is elected outside of the United States, the employee has the option to ship the POV from the losing post to the approved alternate ISMA location on a cost-constructive basis. Follow-on shipment of a POV from the approved alternate ISMA location to the gaining post is authorized on a cost-constructive basis. (4) An employee may ship his or her POV to an alternate destination on separation orders on a cost-constructive basis. The POV must be shipped to the location the employee is actually separating to. (4) Remove detachable items such as hubcaps, cigarette lighters, radio antennas, child/infant safety seats, and tool kits. Only a spare tire/wheel and jack may be stowed in the car. Household effects, unaccompanied air baggage, or consumables may not be placed in the vehicle when shipped. c. Vehicle “Recall Notices” should be corrected before initiating a shipment request (see 14 FAM 618.6). Documentation from a certified mechanic/dealership authorized to perform “Recall Notice” repairs may be required. Any DOS Transportation Office can refuse to accept a vehicle for shipment or storage if the vehicle presents a safety hazard to a vendor’s employees, its facilities and/or equipment. (2) The use of the replacement vehicle is in the interest of the U.S. Government. b. Conditions warranting emergency replacement of motor vehicles include loss or destruction of the motor vehicle through fire, theft, accident, rapid deterioration due to severe climate or driving conditions at a post abroad, civil disturbance, military actions, riot, or similar causes. c. Replacement shipment of a POV is funded and authorized by post in accordance with 14 FAM 523.2-1, subparagraph f(3)(b). d. For Commerce, shipment of emergency replacement vehicles is authorized and funded by Washington, DC headquarters. (6) On the date a request for periodic replacement authority is made, the employee is scheduled to remain at post of assignment for at least 1 year (9 months for personnel with an 18-month tour of duty). The shipment of a new motor vehicle at the employee's personal expense from the United States or other place of purchase to his or her post of assignment has no effect on eligibility for periodic replacement authority, provided the criteria outlined in this section are met. a. If an employee has not had a POV transported at U.S. Government expense from the United States to the employee’s present or previous posts abroad, an authorizing officer may, when funds are made available, authorize shipment of a motor vehicle from the United States to the employee's present post abroad if such shipment is determined to be necessary or expedient. b. On the date a request for a shipment is made under this section, the employee must be scheduled to remain at the post of assignment for at least 1 year (9 months for personnel with an 18-month tour of duty). The shipment of a new motor vehicle at the employee's personal expense from the United States or other place of purchase to his or her post of assignment has no effect on eligibility for shipment under this section, provided the criteria outlined in this section are met. c. For State and Commerce: Shipment of the vehicles discussed in this section is authorized and funded by Washington, DC headquarters; for USAID, shipment is authorized by USAID/W and funded by the posts. (2) Cost of the employee's coach-class transportation by common carrier one way between the post and the point of delivery or pickup. b. The reimbursement may not exceed the cost of commercial shipment of the vehicle. No per diem is allowable and leave must be charged for absence from the post. a. Under section 207 of the Foreign Service Act of 1980 (22 U.S.C. 3927), as amended, the chief of mission, in consultation with other Foreign Affairs agency heads in the country, determines what restrictions or limitations, if any, are placed upon the motor vehicles brought to posts under the chief of mission's jurisdiction. b. These may include, but are not limited to, provisions to assure that the vehicle is suitable and that the import of the vehicle is not primarily for resale. (2) Whether the vehicle was sold or scheduled to be sold before the last 6 months of the employee's scheduled home leave or departure from post, taking into account factors such as curtailment of assignment, evacuation, or extensive damage to the vehicle. (3) For such other action as may be taken by the chief of mission, see 2 FAM 113.1.
a. Vehicles that may be transported include passenger automobiles, station wagons, and certain small trucks or similar vehicles that may be used primarily for personal transportation. Transportation is not authorized for trailers, airplanes, or any vehicle intended for commercial use. b. Transportation at U.S. Government expense is limited to vehicles having a gross size for shipping purposes of not more than 20 measurement tons (22.4 cubic meters/800 cubic feet). An employee who ships a larger vehicle which otherwise qualifies for shipment at U.S. Government expense must pay all costs which result from the excess size of the vehicle. (3) DOT-NHTSA (National Highway Traffic Safety Administration) Vehicle Importation Regulations. b. The employee is responsible for bringing a nonconforming foreign-made POV into compliance with EPA and DOT standards. If compliance is not certified by the manufacturer, either by labels attached to the vehicle or in writing, the vehicle must be consigned to an authorized importer and the employee must post a bond. The foreign-made POV must then be converted at the employee’s expense to comply with EPA and DOT standards, and then be cleared for entry into the United States by the U.S. Customs and Border Protection. Foreign-made POVs that do not meet EPA and DOT standards and cannot be brought into compliance will either be exported or destroyed at the employee’s expense. In addition, the employee may also be subject to any and all penalties for noncompliance. (c) The authorizing officer at the post determines that safe storage facilities are not available and that delay in shipment would expose effects to serious damage or loss from climatic conditions, excessive humidity, pilferage, sabotage, or other hazards beyond the control of the post. In such instances, a statement justifying the use of a foreign-flag vessel is required. b. When the origin or destination is a seaport, it is not necessary to send the shipment to another port in order to utilize a U.S.-flag vessel. To ensure compliance with section 901(a) of the Merchant Marine Act of 1936 (46 U.S.C. 55302) regarding the use of U.S.-flag vessels for transporting household goods and/or personal effects of U.S. Government employees, (see 41 CFR 102-118.195 – What documents must a transportation service provider (TSP) send to receive payment for a transportation billing?). When the post deems use of foreign-flag service is justified under 14 FAM 616.1, written authorization must be issued. This certificate of justification must be signed by either an authorizing officer designated by the Department or foreign affairs agency, or a post's principal officer. The certificate must show full justification for the use of a foreign-flag vessel. The certificate (which may be reproduced locally) must be prepared in triplicate. The original and one copy are submitted to the ocean carrier, freight forwarder, or household goods transporter, as appropriate; one copy is retained by the issuing officer or post. The transportation company must be instructed to submit one signed copy of the certificate with the bill to the paying office. (3) When payment or services can be made through use of surplus foreign credits owned by the United States or from USAID trust funds and U.S.-flag steamship lines will not accept such funds. b. Whenever a foreign-flag vessel is used, the USAID mission or USAID/W MS/AS/TT, as appropriate, is to annotate its records to indicate the reason for such use. a. When shipment of effects or baggage is made by air, and U.S.-flag air service is available, such service must be used in accordance with 49 U.S.C. 13101, unless such use would involve delays which would jeopardize the cargo or be incompatible with the purpose of the shipment. Unaccompanied air baggage shipments need not be delayed in excess of 48 hours to make use of U.S.-flag airlines. b. When U.S.-flag air service is not available at the point of origin of the shipment, routings will provide for transshipment at the nearest practicable interchange point to connect with U.S.-flag air service. An interchange point is not considered practicable if the shipment would be delayed in excess of 48 hours or if transshipment would jeopardize the cargo. c. Whenever the post or the Department routes a shipment via a foreign-flag air carrier, certification must be stamped on the Form SF-1103, U.S. Government Bill of Lading, and be completed by the authorizing officer. When the shipment is dispatched on a U.S.-flag air carrier and no routing is shown, the carrier will be responsible for certification. d. Shipments made through international freight forwarders must comply with the above standards. Forwarders are instructed to submit with their bills a copy of the air waybill or manifest showing the air carriers utilized and justification for any use of foreign-flag air carriers where U.S.-flag air carriers provide service. a. The Department of State or agency may authorize or approve the advance shipment of an employee's furniture, household and personal effects, and privately owned motor vehicle from a post to employee's place of residence, or to an intermediate storage point, prior to the issuance of separation or transfer orders to the employee when advance travel has been authorized in accordance with 14 FAM 532.3, or when it is administratively determined that it is in the best interests of the Service. The U.S. Government cannot authorize any type shipping service for which there is no valid travel authorization and available funding, as such action violates U.S. anti-deficiency laws. For USAID: The USAID mission director may authorize advance shipment of effects in connection with advance travel authorized in 14 FAM 532.2 when it is administratively determined that it is in the best interest of USAID. No storage of effects shipped in advance is allowable. When advance shipment is authorized, Form DS-4020, Repayment Agreement for Advance Travel of Family, must be executed by the employee. b. The employee is liable for any costs resulting from the advance shipment of effects in excess of those costs which may be authorized subsequently; therefore, this authority should be used with extreme care. c. The advance shipment of household effects may be authorized to the employee's separation address of record in the United States in connection with marital separation, or divorce, or statement of dissolution of domestic partnership as defined in 3 FAM 1610, only if a legal property settlement exists or the employee otherwise agrees in writing and identifies those effects which are to be shipped as the property of the spouse or domestic partner as defined in 3 FAM 1610. Cost-constructive shipment to any other points would be based on shipment to the employee's separation address of record in the United States. No shipment of a POV will be authorized at U.S. Government expense under this section. The employee's shipment allowances on the next travel authorization to include shipment of effects will be reduced by the amount shipped in advance. No repayment liability will exist for this advance shipment based on the employee's next authorized destination for shipment of effects. Shipment may also be authorized subsequent to the return travel of the spouse or domestic partner under 14 FAM 532.8 after execution of a legal property settlement or written agreement by the employee, either as advance shipment, or at the time of the employee's next authorization for shipment of effects. As this shipment is to be considered final return of effects to the United States, no further shipment of the effects transported under a legal property settlement or the employee's written agreement will be authorized at U.S. Government expense. Where the Department, agency, or post has contracts or approved prices or arrangements with designated packers and shippers, payment for the services of such packers and shippers is allowable. If other firms are used at the request of the employee, the employee must pay for any excess costs involved. a. U.S. Government employees who return to the United States upon termination of "assignment to extended duty," abroad may import effects free of duty under subheading 9805.00.50 HTSUS (Harmonized Tariff Schedule of the United States). This same privilege applies to returning family members who have resided with employees at such post and to any person evacuated to the United States under U.S. Government orders. b. For a definition of "assignment to extended duty," see 19 CFR 148.74(d). The personal and household effects of this employee and members of the employee's family are eligible for duty-free entry under subheading 9805.00.50, Harmonized Tariff Schedule of the United States (HTSUS) since the employee has completed an assignment of extended duty abroad. Home leave covered by these orders is statutory leave prior to return for a new assignment to extended duty abroad. (3) Alcoholic beverages not accompanying travelers are forwarded through commercial channels and are not shipped in care of U.S. Despatch Agencies. Owners will be responsible for clearance and payment of import duties as well as Federal and State taxes to the Customs authorities without the assistance of U.S. Despatch Agencies. (3) Traditional Customs rules and regulations still apply to shipments entering the United States, such as the prohibition against shipping any meat or fish products to the United States. Employees planning to ship foodstuffs in their HHE should consult the CBP publication "Know Before You Go" located on the U.S. Customs and Border Patrol website. High officials of the executive branch must be extended "courtesy of the port." Under this practice, priority treatment is accorded by U.S. Customs inspectors (in those ports where such treatment can be of value), but the returning official is liable to inspection of baggage and for payment of duty on official imports over and above the normal exemption provided by law. (5) The firearms and ammunition must be shipped directly to the importer or dealer handling the importation. Under no circumstances may firearms and ammunition in this category be included in household or personal effects shipments to the United States, nor shipped separately in care of the U.S. Despatch Agent. Expenses for shipments of firearms or ammunition, including importer's fees, may be charged against the travel authorization of the employees concerned. The method of shipment must be determined by each post on the basis of available facilities. a. The employee is responsible for ensuring all vehicle safety recall notices are corrected before shipping or storing the vehicle. Employees can determine if their vehicle has a recall on the National Highway Traffic Safety Administration website. Any DOS Transportation Office can refuse to accept a vehicle for shipment or storage if the vehicle presents a safety hazard to a vendor’s employees, its facilities, and/or equipment. It is the responsibility of each employee importing a personally owned vehicle into the United States to ensure that the vehicle conforms to Federal motor vehicle safety standards (49 CFR 571) at the time the vehicle is imported into the United States. b. The employee should complete Form HS-7, Importation of Motor Vehicles and Motor Vehicle Equipment Subject to Federal Motor Vehicle Safety Standards, issued by the U.S. Department of Transportation, National Highway Traffic Safety Administration, and forward it to the respective U.S. Despatch Agent at the time bills-of-lading and other shipping documents are forwarded under existing procedures. c. The National Highway Traffic Safety Administration has prepared a booklet, "Federal Motor Vehicle Safety Standards," including import regulations, which provides basic information concerning import restrictions and compliance with safety standards. Complete information as to current applicable safety standards must be obtained from the U.S. Department of Transportation, National Highway Traffic Safety Administration, Washington, DC 20590. As a condition of funding the storage and shipment of personal property, the Department of State reserves the right to open and inspect all personal property shipments that are in storage or transit under its authority. The Office of Logistics Management (A/LM) may, at its sole discretion through its offices or agent(s), open and inspect any storage lot or shipment without prior notice, for purposes of: ensuring compliance with Department of State policies, import restrictions, other regulatory or legal requirements and/or contractual terms; assessing or alleviating actual or suspected damage to the contents; for safety considerations; and for fulfilling other reasonably necessary functions incident to the transport or storage of the effects. Upon the discovery of evidence of any possible infractions or violations of regulatory or legal requirements, the Office of Logistics Management or its agents must report the existence of that evidence to appropriate authorities, including appropriate law enforcement authorities. In addition, the Department must comply with requests from other U.S. Government agencies or with commercial carriers to open and inspect shipments in transit. NOTE: Most carriers on their commercial bills-of-lading reserve the right of inspection as part of the terms and conditions of acceptance of a shipment. a. Commercial bills of lading are the preferred method to contract for transportation services and freight forwarding. Electronic versions should be used when possible. Alternatively, General Services Administration (GSA) has provided an optional, unnumbered Transportation Services Order form. The GSA has discontinued the U.S. Government bill of lading (GBL) for domestic shipments, but posts may still use a GBL for international shipments. b. All contracts for carriage must indicate that they are made under 41 CFR 102-117 and 118. This shipment is made under all terms and conditions of the Form SF-1103, U.S. Government Bill of Lading International and Domestic Overseas Shipments, and is subject to the terms and procedures set forth in Comptroller General of the United States Circular Letter B-150556, dated June 16, 1967.
b. Compliance with this provision is mandatory for U.S.-flag carriers and should be enforced to the extent possible when commercial ocean bills-of-lading are issued by foreign-flag carriers. These provisions cannot be applied against foreign-flag carriers without their concurrence. c. A copy of the Comptroller General's Circular Letter B-150556 may be given, upon request, to any carrier unfamiliar with its terms. Special crating of personal effects is considered for international shipments. Special crating is generally not considered for CONUS to CONUS shipments to include CONUS shipments into storage. Documented value is an official appraisal with the appraised value listed by item/set, insurance policy insuring item/set for a specific value, or a receipt or proof of purchase. (6) Flat screen TVs (greater than 63”). Pre-move surveyor feels this is necessary to safely transport item. Employee wishes the items to be specially crated. Under the conventional pack-and-crate method, charges for various segments of transportation are assessed differently. Converting these various costs to a common denominator (100 pounds net weight) is the major problem in comparing costs. NOTE: The cost listed above is only an example. The employee’s actual HHE shipment entitlement is stated on the employee’s travel authorization. Only the authorized HHE weight will be shipped at U.S. Government expense. If the HHE weight exceeds the employee’s entitlement, the Transportation Advisory Section will assist the employee in identifying the additional costs that the employee will have to incur to ship the excess HHE weight. The employee must obtain all excess transportation costs from his or her transportation counselor. Total cost per 100 lbs. NOTE: The cost listed above is only an example. The employee’s actual UAB entitlement is stated on the employee’s travel authorization. Only the authorized weight will be shipped at U.S. Government expense. If the UAB exceeds the employee’s entitlement, the Transportation Advisory Section will assist the employee in identifying the additional costs that the employee will have to incur to ship the excess UAB weight. The employee must obtain all excess transportation costs for his or her transportation. Under the conventional pack-and-crate method, the charges for various segments of a move are assessed differently. Converting these various costs to a common denominator (100 pounds net weight) is the major problem in comparing the costs of through bill-of-lading shipments to that of a conventional pack-and-crate shipment. A review should be made of all shipments export-packed during a recent period to ascertain the total net weight, gross weight, cubic measurement, and cost. If the basis for the packing charge is other than per 100 pounds net weight, the cost per 100 pounds net weight can be computed by dividing the total net weight into the total cost. The net weight and gross weight are defined in 14 FAM 611.3. The tare weight is the gross weight minus the net weight. The tare ratio, which is the percentage of the tare weight to the net weight, is obtained by dividing the tare weight by the net weight. The number of pounds gross weight in a cubic foot may be obtained by dividing the gross weight by the number of cubic feet. Conversion factors developed from post records: 100 pounds net weight = 138 pounds gross weight (38% tare ratio); there are 9.2 pounds of gross weight contained in 1 cubic foot. The overweight cost formula is actual transportation costs minus authorized transportation costs = total amount to be paid by the employee. New York and all other gateways not covered below (applies to supplies only; for personal effects see below). North Carolina, South Carolina, New Jersey, New York and Philadelphia. Port Everglades in Fort Lauderdale. The post consigns, marks, and prepays the shipment to the New York Despatch Agent at the DA's JFK Liaison Office. (The shipment enters the United States and ends at this airport). The post sends the shipment prepaid only as far as JFK Airport. The DA's Liaison Office clears the shipment through U.S. Customs and makes all arrangements to send the effects on to employee's home leave point of final U.S. destination. The Department's Liaison Office at Dulles International Airport will clear the shipment through U.S. Customs. Unless the post has provided a delivery address on the air waybill, the Dulles Liaison Office will give the UAB to the Department's Inbound Contractor to hold. New York and all other Atlantic coast gateways. Miami, New Orleans, and other Gulf gateways. Seattle and all other Pacific coast gateways arriving at Seattle-Tacoma International Airport (consignees only). Washington, DC, Maryland, and Virginia arriving at Dulles International Airport (consignees only).